No kids – don’t do drugs, unless of course its alcohol or caffeine, both of which are mandatory if you work with computers. Prior to doing this work at Pearson, I had the opportunity to work with an old friend of mine on a game he had developed for iOS and Android. It’s a match-3 game that features a lots of drugs. Kind of like Candy Crush, but with added Viagra. The game was already complete and fully playable. I was asked to re-skin the product to a high standard, replacing the ‘stock’ content that was already in there. 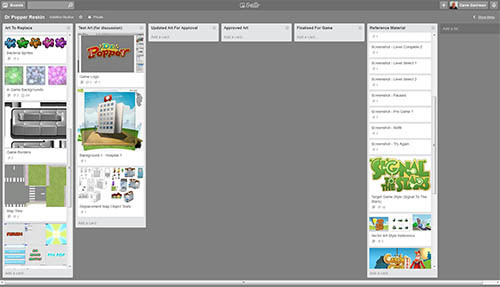 I decided to use Trello.com to organise the work, something I’ve been using for my own Unity SDK projects. I wasn’t sure if the coder I was working with would take to it, but I think he started to warm to it a few weeks into the project. All the art to be replaced was uploaded there, along with all the reference material. We had panels for ‘work in progress’ art – where we could discuss the suitability of various elements. Essentially, the assets ‘flowed’ from the original elements on the left, through an approvals area, then finally into a ‘game ready’ section at the end for slotting directly into the product. A lot of the work was ‘like for like’ replacements – however it wasn’t practical to replace much of the User Interface in this way, so the coder re-implemented new layouts to suit the new artwork. The onus really, was on getting the work done as quickly (therefore as cheaply) as possible. But, the truth is – art is something you can’t rush. If you skimp on time, it shows in the end result. And people are very quick to point out when something doesn’t look right, so short-cuts were a bit thin on the ground. In the end, the game art was created using a combination of 3D Studio Max, Adobe Illustrator, Adobe Photoshop – and a new piece of software, Anime Studio Debut. It was impractical to re-model and re-render many of the game assets, so a lot of the game elements are plain, unmapped 3D models, heavily re-worked and textured in Illustrator or Photoshop. 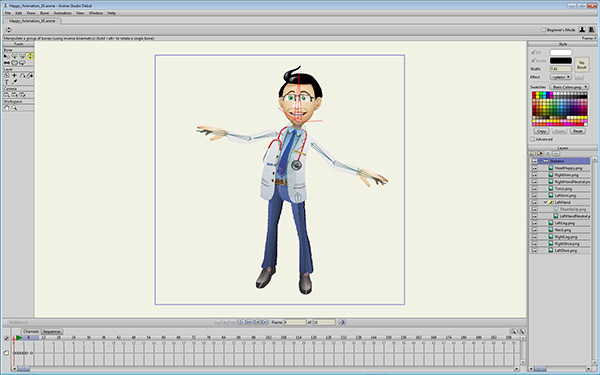 Now, part of the game featured a 3D render of the character performing a ‘thumbs up’. Replacing this with an upgraded character would have been impossible within the budget, so I opted to recreate it in 2D. For this task, I ended up using a neat little application called Anime Studio Debut. It cost me in the region of £20, which is a bargain for what the software does. The application is actually the ‘entry level’ version of the software. And as such, it does have limitations – the most notable being the size of the canvas that it renders, which is just 900×900. Not ideal for epic HD animations. But, it’s an okay size for most game sprites. It took a bit of experimentation to find the best method of 2D rigging the character. Originally I thought all parts of the character needed to be a separate, but I had problems at the joints of the knees and arms. In the end, I opted to keep some parts of the figure whole – with the software handling the joints – and that worked really well. I was impressed with the feature set, which included Inverse Kinematics and joint limits. You can plant the characters feet on the floor and the legs will buckle automatically if you move the body down. You can also switch the various 2D elements during the animation (different heads for example) – which is great. Definitely a useful tool for doing this sort of thing on a tight budget! I learned a fair bit from doing this project. I found a number of short-cuts for producing some clean looking cartoon art (cartoon work isn’t one of my strengths!) If I get the opportunity in the coming weeks, I will write about the methods / procedures used for doing this sort of 2D work. You might find some of the ideas useful for your own projects.